Anyone have any experience with these? This is the most accurate Jeep style body I've seen out there. I plan to do the "normal" mods to it over time, but my daughter would really dig her own big jeep like dads. This keeps catching my eye, but I'm finding few reviews from anyone who has modded one. Thanks in advance! It looks pretty junky. Monitor Craigslist in your area and look for a Gaucho. You won't be disappointed. What makes it look "junky"? It doesn't look bad to me. Bennettj13 wrote: What makes it look "junky"? It doesn't look bad to me. Experience from owning hundreds of ride ons over the years. I can tell that the tires look flimsy and the seams on the rollbars show that the car is likely made from thin plastic. Plus experience tells me that a factory remote is a giveaway that it's a cheap ride on. Quality costs money though and a nice ride from Peg Perego runs $500-1000 new. But that's why most people on this site buy used off Craigslist. Experience tells me that a ride on like that jeep might be ok for your kid for a year or so, but when you go to sell it, you will only get a fraction of your $ back out of it. And that's assuming everything is still working perfectly on it which is not likely. Alternatively you can pick up a nice used (like new) Peg Perego ride off Craigslist for a similar price and a couple years down the road sell it for that same price. Factory remote also usually means some sort of circuit board control so it's harder to modify later with higher voltage. What would worry me about buying it is the only two reviews are from a month ago and sound more like advertisements than an actual review. Also the specs are not very accurate and seem to contradict themselves which means the company selling it most likely knows absolutely nothing about the product itself. I would recommend buying used as well. Use the money you save to get extra batteries or extra powerwheels! We got one for our daughter for x-mas this year.. the overall quality is great . Very sturdy body and roll bars. 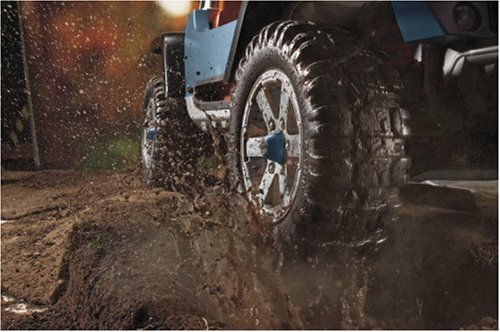 Tires are thick sturdy plastic with rubber traction. The suspension is okay the rear springs are pretty stiff . The radio is a little tricky to navigate at first (the institutions are limited) but the functions work well. My biggest complaint is the low end torque (does not take off well) the top speed is good but not good on grass. I have replaced the 2 drive motors with donated motors from her old Barbie Jeep (witch were very good torque) it helped but not much it does seem to be a little faster then before. I'm thinking there is a resistor on the PC board to limit the current being delivered to the motors. I'm working on a hand held switch for direct power to the motors to figure out if it's a gear ratio or loss of power through the PC board. I modified mine for the circuitboard to power on two external relays and wired them in reverse polarity so that it can go forward and reverse. The torque is all there now due to being straight to 12v battery. Only drawback is that it's only one speed and still needs more torque but way better than stock. It will climb curbs now. I really think this mixed with some better motors will be plenty. The front tires will hop off the ground with a fresh charge. Can you explain in more detail about the items you used and the wiring? Are you still on 12v? I was thinking this has some type of ESC that gradually increases voltage for the suddel start. Will wiring another battery fry the radio and or control board? have you done anything to your jeep yet since your last post? I purchased this jeep because of the remote control function. I figured it would be a good base for future mod being that it is already had the required steering upgrades needed for rc. Unfortunately the remote control function doesn't work very well. The remote keeps losing sync and i have had to drag this thing home a couple of times. I was wondering if anyone knew how to add a real rc board to this so i can bind it to real remote. My son is a little too young to drive this by himself now but he will be able to soon. I dont want to make this a true rc i want him to still have the option to drive it once he is older. Stephenrinaudo wrote: I modified mine for the circuitboard to power on two external relays and wired them in reverse polarity so that it can go forward and reverse. The torque is all there now due to being straight to 12v battery. Only drawback is that it's only one speed and still needs more torque but way better than stock. It will climb curbs now. I really think this mixed with some better motors will be plenty. The front tires will hop off the ground with a fresh charge. Can you post photos? I am guessing the only speed is just fast/high? Does the remote still work? I am actually doing this mod right now. Just bought the Flysky fs-gt3b off Amazon and plan on running seperate battery for the reciever and powering the motors with a Slow Start Device I bought from china for the two 12v motors and a separate Slow Start Device for steering servo. I'll let you know how it goes. Did you ever figure out the issue with the remote? Looks like I blew a fuse on my circuit board. The company is refunding my whole purchase, but I'd like to get the jeep up and running again. Any advice? I bought one of these jeeps for my daughter last year. As mentioned before, it is flimsy plastic and smaller than it appears in any add i 've seen about it. There isn't any type of frame under it. It's only big enough for one child which is fine but it's o not rated for something like 60 lbs i think. I never had a single issue with the remote losing signal and I honestly can say I did enjoy driving my daughter around in it. I put a second battery but because of the circut board I kept it at 12v but it gave us an all day run time. I also loaded it with led lights. This thing would light up the night. Everything was great until one day I was installing some more lights and a hot Wire grounded itself out and pop. Board burnt up. It was my own fault, nobody to blame but me. I tried to identify the burnt components to replace them. Nothing had numbers printed on them. So I contacted the company to see if I could purchase a replacement board. The co. would not sell me one. They said if the jeep was still under the factory warrantee they could help if I had proof of purchase. If the warrantee was expired there isn't anything they can do.... Best Choice Products will not offer any assistance after the warrantee has expired. So replacement parts are not available. Although my experience with the actual jeep was good, Best choice products customer service policies could use an overhaul. So because of that I wouldn't recommend the jeep. You would be better off with a better known brand. Is this the board you need? I had a similar issue and this replacement works great. I wanted to add some info about the Best Choice Jeeps and I would assume the other ride on toys from them. Sounds like attaching another 12volt will do some harm. Is it possible to attached a 6volt to the 12 (18volt)? Could you please go into more detail with this mod. I would love to speed up my lil man's BCP Jeep! So here is what I learned about the best choice ride on. I got it for my son when he was 1 to get him used to it. It worked great the remote was great the speed was where I wanted it to be for a 1 year old. Fast forward to 2 years old by this time he was grabbing the wheel to steer and he broke the motor that controls the steering. No big deal because he was listening when I told him where to drive.The motor kill from the remote still worked. By the time he was 3 I thought well this seems a little slow for him so I got him the 24v mod from Eastcost power up Plugged it in and bam!! he is flying and loving it ( the kit makes you not be able to use the remote at all). So as I turned up the speed on the kit making it go faster and faster the motors burnt up. I kind of expected it. I am in the process now up grading the motors . Seems like the gears were holding up but I dont think I will have him running on 100% power. GPS Tracked him at 11 MPH. Thats a little to fast for me to keep up on a bike going up hills. I should add all of his riding in on pavement. Here is a link to the kit I ordered. Peg Perego https://toyboxadvisor.com/best-12-volt- ... ris_Outlaw or the Powerwheels Jeep are the way to go if you want it to hold up. I suggest going ahead and getting the 18V(you can keep the governing screw in for a while). My son kept his hurricant for 4-5 years kids hanging all over it and pulling a skateboarder. Did replace one motor(easy). DO not use the stock charger, they do not automatically stop charging when the battery is done and WILL fry the battery. Just rig pigtails for your shummocker or other automotive charger. WHen she get older check this website out and have fun with mods. Could someone with the BCP Jeep be so kind to tell me the size/diameter of the headlights? I'm picking out lighting upgrades for this exact Jeep and would like to put "angel eye" rings inside the headlights. The Jeep hasn't arrived yet or I'd measure them myself. Thanks to anyone who can provide.